Please join Alderman Debra Silverstein on Monday, July 30 for the annual 50th Ward Movie in the Park celebration! 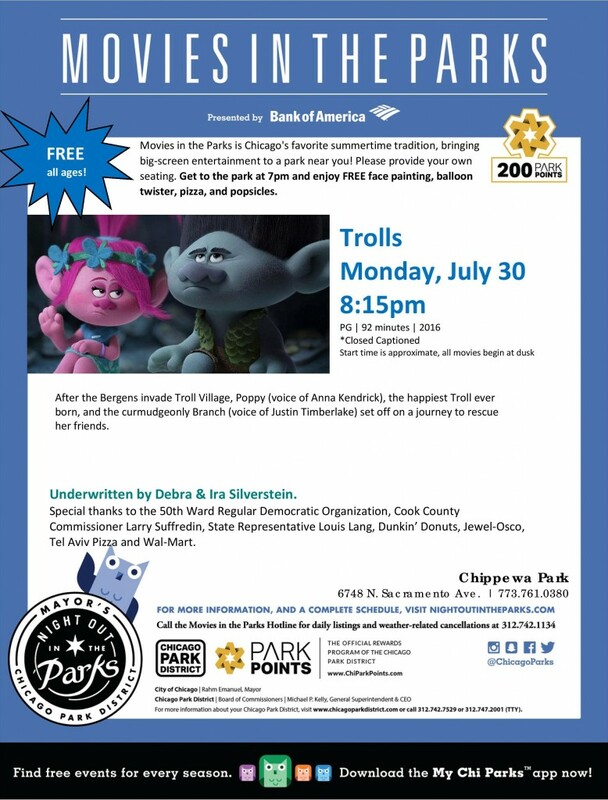 The 50th Ward, along with State Senator Ira Silverstein, will be screening Trolls at Chippewa Park, 6748 N. Sacramento. The show is 92 minutes long and is rated PG. The movie begins at dusk, but the fun begins at 7 p.m. We will be sponsoring a special family fair before the show. Come early for free face painting, balloon twisters, pizza and snacks! The Movie in the Park is one of the best local community events every year. We are always joined by hundreds of local children and families for a fantastic time! For more information, please call the 50th Ward Office at (773) 262-1050 or email info@50thwardchicago.com.